I remember two years ago reading an article on Forbes that said being an "event coordinator or planner" was the fifth most stressful job in the country. This was only surpassed by the military, law enforcement, firefighters and airplane pilots. I looked up the article again, and the same Forbes article for 2017 still ranked it as the 5th most stressful job. It was that same year that I started dreaming about the possibility of Blake and I owning an event venue one day. Somewhere in the mountains, with a small pumpkin patch and/or Christmas Tree Farm on the property too. We have big dreams, let me tell ya. But the reality of knowing that "event planning" was so stressful really scared me. And it still does, if I'm being honest. I know how incredibly stressful it is to plan the girls' birthday parties (with a total of 20 guests in attendance), so I can't even imagine planning a party for 100-200 +. However, there's something about event planning stress that's always stuck out to me - the outcome is 99% of the time SO WORTH it. Seeing the smiles on my girls' faces; hearing the guests say how much they've loved the parties; looking at all the pictures of the party and seeing how it all came together - to me, that's always made the stress so worth it. But what if I said it didn't have to be as stressful? What I've realized is that the things that make party planning so hard is not giving myself enough time. procrastination is a buzz killer. So, what if I said by just implementing a few steps each month, you can plan a dream party in five months versus cramming it into a few short last minute weeks? It's possible friends and I'd LOVE to share my "Five Month Party Planning Strategies" with you! You can download the full file here for easy reference on your own desktop computer, but I'll also walk you through each step here! So get ready, grab some coffee or tea, and let's start planning the best party EVER! You can download our overall checklist here and print it off! We suggest laminating it and storing it away so you can use it over and over again for parties. Simply use a dry erase marker (or permanent) over the laminate and mark off items as they're completed. If you really wanna overachieve, download our full party planning strategy PDF booklet, go to Office Max or Staples and get it laminated and binded, then use this as your party planning booklet! You can write straight on the sheets for each of your parties and make notes as you complete each task! Be sure to check out our "birthday party inspiration" blog post here! 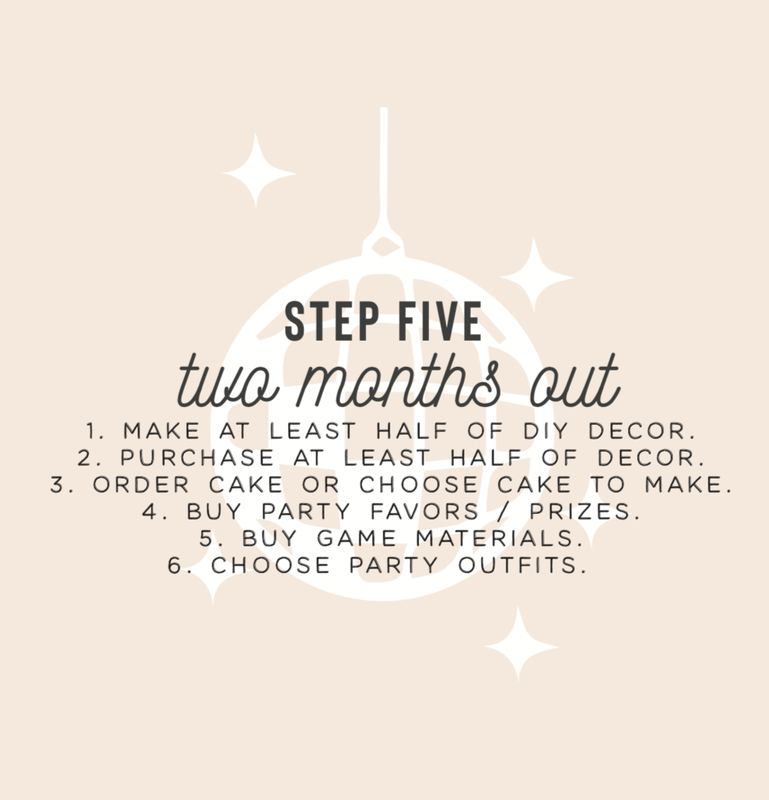 I truly hope someone can implement some of these steps while party planning! And I also pray that we can all make party planning a little less stressful by being proactive and intentional in alllll of the things that go into making a party so incredibly magical for those we love most. Remember, don't stress out. Give yourself five months to plan the best party EVER!